I’ve been fortunate enough to have attended Comic-Con for three years now. But 2018 was the first year in the convention in which I actually had the time to prioritize panels and build in rest and relaxation into my schedule (it’s possible!). I loved getting the chance to connect with Twitter friends in real life (shout-out to Chris King and Tiffany, because it was great to finally meet you both in person), I loved seeing the passion in fans for their favorite shows, and I loved getting the chance to get exclusive glimpses into upcoming content. So here, I’m going to break down some of my favorite moments and memorable panels from last weekend. The best panels I attended (or attended in spirit, thanks to insane lines) were the ones regarding my favorite network comedies. I sadly missed out on the Brooklyn Nine-Nine panel, but Chelsea was lucky to attend and live-tweet the entire thing. Somehow over the last year, that show has become one of my absolute favorites. I think that it perfectly balances silly humor with real character moments and integrates real-world issues (racism, active shooter situations, etc.) with ease and balance. It doesn’t oversentimentalize, but it doesn’t trivialize either. 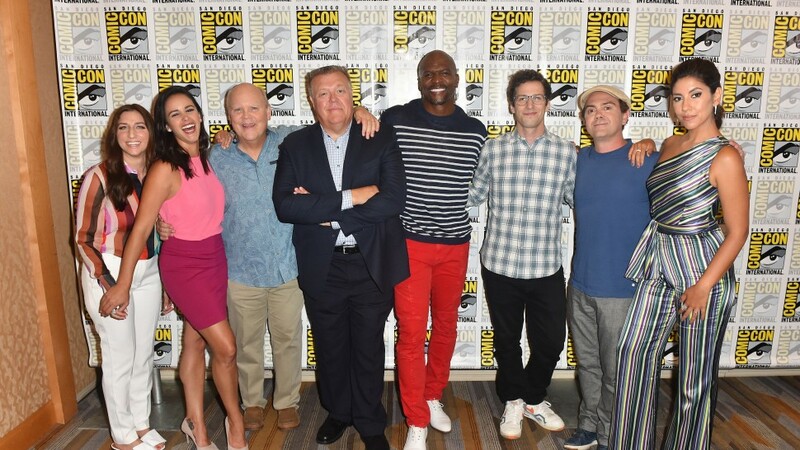 Brooklyn Nine-Nine’s cast is filled with delightful, wonderful human beings who were just so happy to attend the convention that they charmed the pants off everyone in the crowd. I had no idea so many other people loved the series! You can expect new marital adventures for Jake and Amy in the upcoming season! Their foundation is still their friendship, so it’s bound to be fun. Dan Goor consulted Stephanie Beatriz regarding Rosa’s storyline coming out as bisexual. He wanted a real, bisexual female voice and Stephanie discussed how she was honored to provide that insight. Terry Crews discussed how his character is essentially the mom of the precinct. We can’t argue with that one. A fan teared up (and made Stephanie Beatriz and Melissa Fumero cry too) when she discussed how important it was for her to see strong, smart Latina characters on television. 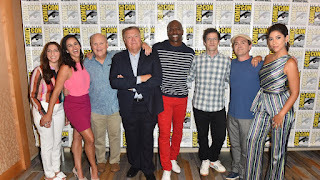 Andy Samberg discussed how everyone wants the series to tackle difficult storylines with the respect they deserve so they take their time in developing those. The reason I was late for Brooklyn Nine-Nine and had to miss it was because I was across the street at the convention center attending the final Crazy Ex-Girlfriend Comic-Con panel. Though most of the cast was not present, Rachel Bloom and Aline Brosh McKenna were there to discuss some of the show’s boldest and bravest moments, as well as what Rachel and Aline have planned from the beginning. And yes, they know how the series will end. I really appreciated hearing from these women for a few reasons. One, of course, being that Crazy Ex-Girlfriend has climbed the ladder in my heart as one of the most inventive and engaging shows on television. And truthfully, I love panels where I get to hear from show creators about decisions they make and how they come up with their stories. Rachel and Aline work seamlessly together and this show is their baby. I’m so grateful that it exists on television — where else can you find mental health and real issues women deal with discussed with such frankness and hilarity? — and am really looking forward to the final season in this series. I can tell that Rachel and Aline, along with their writers, have a clear-cut direction and that always makes for tight stories and character arcs. Rachel performed the season four theme song for us, which sounds like it’s going to be absolutely delightful. We got to watch last season’s gag reel proving, once again, just how much fun these people have together. Rachel and Aline talked about the depiction of mental health in the series when an audience member asked whether the series is anti-medication. Aline recognized that the purpose of their series isn’t clinical, but to provide dialogue and note that Rebecca Bunch was misdiagnosed and therefore her medication wasn’t helping her at the beginning of the series. Aline does believe that Rebecca is probably on some low-dose medication now in the show. The writers and actors have such a great rapport with each other that often the writers will learn what skills and talents the actors have and write them into the characters on the show. The final season of the show will focus on Rebecca Bunch’s desire to marry internal changes with her external realities, and that’ll be the challenge. Next up: I adore The Good Place. Truly, I do. It’s the kind of comedy that consistently reinvents itself without feeling trite or cliche. And watching their Comic-Con panel solidified that for me. I was lucky enough to have center seats to the panel, where we heard all about how Jameela Jamil has only kissed seven people in her whole life, and where the cast apologized to any Floridians for all of the show’s jokes about the state (Don’t worry, guys. I’m from Florida. You’re not inaccurate in the jokes.) We heard the cast members tease one another but also boast about each others’ talents. Kristen Bell and Emmy award nominee Ted Danson (the only thing host of the panel, Marc Evan Jackson would call him) noted that the chance to work with each other was what drew them to the process. And Danson gave all the credit to Mike Schur for the success of the show and success of the cast on it. And I got to listen to Mike Schur — one of my writing heroes, honestly — discuss the significance of the show, the difficulty in writing a comedy featuring ethical debates and discussions, and why his series can be watched with families. We even got a glimpse into the first two minutes of the third season. If those moments are any indicator, the next season of The Good Place is gonna be great. I’ve personally stopped watching all DCTV series within the last year, but I attended the panels because I knew our audience loved the series represented and would love scoop. (We didn’t get into Ballroom 20 in time for the Supergirl panel, but alas; that was okay.) Honestly based on the panels alone, I think I’d reinvest quickest in DC’s Legends of Tomorrow. Their panel not only provided great scoop, but the entire cast was absolutely adorable and fun. It’s clear they love working together and care about their characters. Dominic Purcell gave insight into Mick, by telling us that: “With any tough guy, there’s always a defense mechanism. Deep down, Mick is very dark. But at the same time, he’s a sweetheart deep, deep, deep down there.” Meanwhile, we also heard that we’d see softer sides of both Sara and Ava’s characters this season. I will say that the most intrigue I had was attending the Arrow panel. With a new showrunner who’s been with the series since the beginning, I was interested to know whether or not the show would have a shift in creative direction. Beth Schwartz emphasized the fact that she’d be putting her own twist on the Arrow universe (she loves the dark stuff, God bless her) but that the show would still essentially feel the same. Based on the teaser for the upcoming season, I can sense a slight shift in tone; the video felt more in line with a Marvel Netflix series than a show on The CW. I’m intrigued by it all — but was mostly intrigued by the fact that Felicity would seemingly finally get her due and agency. Part of my curiosity was whether or not female characters would have better agency and representation now that Arrow has a female showrunner. I’m hopeful for fans that they will! Later, I attended The Flash’s panel. I think Grant Gustin and Tom Cavanagh could have their own comedy special with how much they tease and seem to enjoy working with one another. Speaking of female agency: I was thrilled to hear Candice Patton discuss her desires for Iris moving forward — especially in regards to her career as a journalist. She noted how journalists in 2018 are superheroes and feels like Iris needs to shine in that area this year. But the real MVPs of the DCTV panels were the kids! At Arrow’s panel, Sarah — a little girl from last year who received a necklace from Stephen Amell — returned this year, and Amell gifted her a bow that he stole from the set. At The Flash’s panel, two little girls hilariously asked the question on everyone’s minds: Why is the security at S.T.A.R. Labs so awful? But fun wasn’t just what these kiddos were there for; one child asked a really amazing question about what Grant Gustin thinks Barry learned from both of his fathers and would pass on to Nora as a dad. Go home, adults. Kids won Comic-Con. I screened three pilots at Comic-Con this year, since I opted to skip preview night (and while it’s not a pilot, I did actually watch an episode of Steven Universe. I have no idea what the show’s about still, but the cast was delightful and the fans were absolutely adoring in their love for the show): Charmed, Magnum P.I., and Amazon’s Jack Ryan. Most of those shows aren’t really on brand for me. I watched Jack Ryan simply because it happened to occur during Amazon’s panel, but if it wasn’t for John Krasinski, I would not have been engaged at all. The Amazon panel in and of itself was a little interesting, since we got teasers for the upcoming series (including the only one that piqued my interest — a series from Neil Gaiman, starring David Tennant), and spent a little time on each creator. Nevertheless, I sat through the Jack Ryan pilot because of Krasinski. He doesn’t disappoint (though I still found his performance in A Quiet Place to be more engaging), and the show does weave in some humor and Krasinski’s knack for making the best facial expressions. That brings us to the Charmed reboot (seriously, are there no new ideas anymore, people?!) — the most divisive pilot. I met people throughout the weekend who hated it, and some who loved it. As a disclaimer to my review of it: I never watched the original series. Not in its initial run, not in reruns. So I went in without any real expectations and found myself pleasantly surprised by how much I enjoyed it. 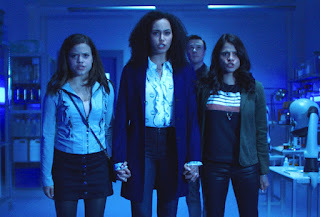 The acting is decent, but expect yourself to find Charmed in 2018 to be a mix of The CW supernatural dramas and Pretty Little Liars. The series is set in a college town and the actresses play young women in college. 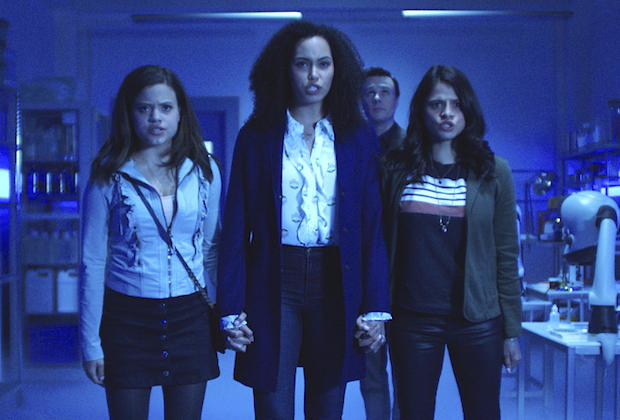 The new Charmed features women of color in the titular roles, and there’s LGBTQ representation as well. While I know fans of the original series might not enjoy the reinterpretation, I actually found it to have potential as a “new” show for a new audience. Chelsea mentioned to me that the series would pair well either before or after Riverdale, which I agreed with. It definitely has a new look and feel, and will most likely reach a new audience for 2018. Cloak & Dagger’s cast was so delightful together on stage, honestly. I was really excited for their panel because I just got into the Freeform series recently and found it to be really compelling and well-produced. The cast was so cute and simply just grateful to be a part of the Marvel universe! Both Aubrey and Olivia mentioned how fortunate they feel to be representing their characters on the small screen. And bonus — during the panel, we learned that the series is renewed for a second season! I love the complex issues that Cloak & Dagger explores; it doesn’t feel like it sensationalizes them. But what I really love is that these characters aren’t archetypes. Tandy and Tyrone make good decisions and bad decisions. Tandy, especially, is an incredibly layered and complex female character who makes bad choices for good reasons. She feels like the world took everything from her and she needs to take it back. Tyrone is the stereotypical “good kid” who has a lot of anger within him — justifiable anger, mind you, but anger no less. I think Cloak & Dagger is such a compelling series and the cast and crew were passionate and fun in their first ever Comic-Con panel. 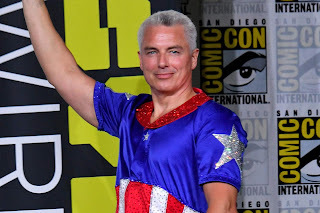 Each year, a panel has conflicted with my ability to attend “Anything Goes with John Barrowman,” but FINALLY this year I was able to attend and was not disappointed. Barrowman is such a character, and he has personality enough to fill the entire Hall H if Comic-Con wanted him to. The best thing about the panel was that Barrowman is a fantastic storyteller and spent most of his time talking about his experience with appendicitis last year. Near the end of the panel though, we got a more solemn glimpse into our favorite former Whovian by listening to him perform a few songs on stage. I absolutely love how wild John Barrowman is, and am glad I got to see him in person this year! Did you attend Comic-Con? What were some of your favorite moments and/or panels? Did you eat as many Auntie Anne’s soft pretzels at the convention center as I did? Sound off in the comments below!